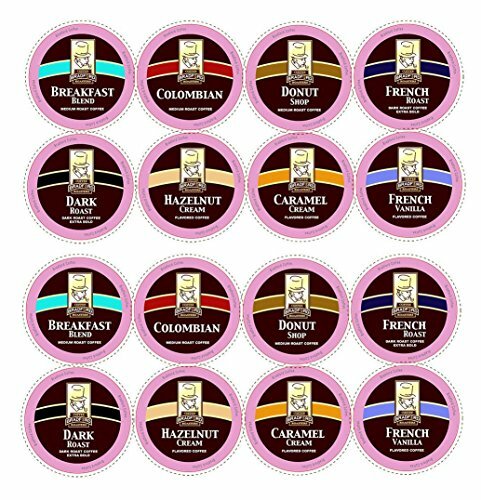 Bradford Coffee for Keurig K-Cup® and compatible brewers. Available in 100 count K-Cup® variety packs. Each box contains an assortment of 8 different gourmet, small-batch roasted coffees. The Bradford Coffee Promise: You no longer have to sacrifice quality for convenience. We're proud of our gourmet K-Cup® coffees, and we're confident that you will be satisfied too! We use the highest quality 100% Arabica beans; freshly roasted to order. Our single serve K-Cups® are compatible with your favorite single-serve coffee brewer. All of our coffees are freshly roasted and packed in the USA. Box Contains Apx. mix of: 14 each of: Colombian Nariño, Donut Shop Blend, Breakfast Blend, Dark Roast, French Roast. 10 each of: French Vanilla Flavored, Hazelnut Crème Flavored, Caramel Créme Flavored. Keurig Inc. K-Cup® is a registered trademark of Keurig Inc. If you have any questions about this product by Bradford Coffee Roasters, contact us by completing and submitting the form below. If you are looking for a specif part number, please include it with your message.